The Partiologist: Chocolate Chip Pumpkin Cheesecake! 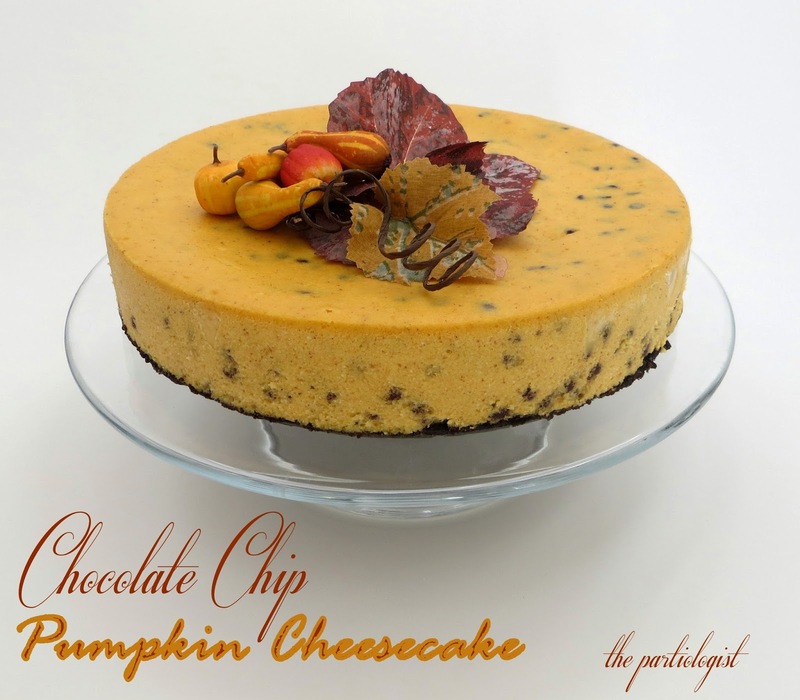 It's only Monday, so you still have time to make this pumpkin dessert for Thanksgiving. Even if you're not a lover of pumpkin pie, which I'm not, the combination of pumpkin and chocolate are a favorite. 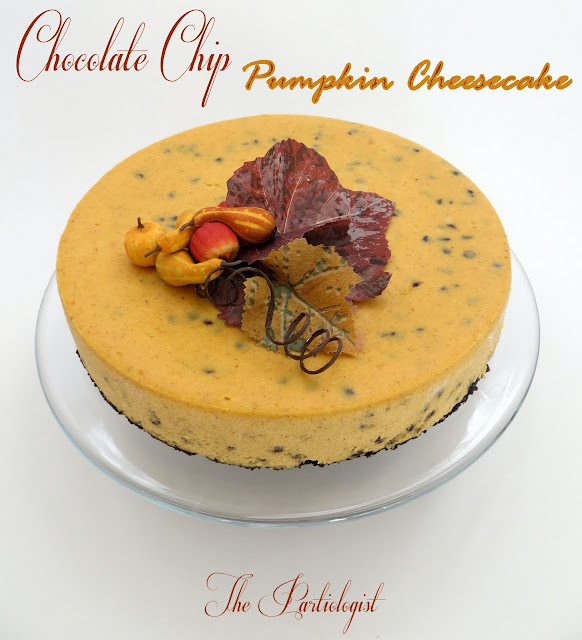 When I came across this cheesecake, I thought it would be perfect for Thanksgiving, you know, so I could serve pumpkin like everyone else, just not in a pie. And I am very thankful too. For many many things. 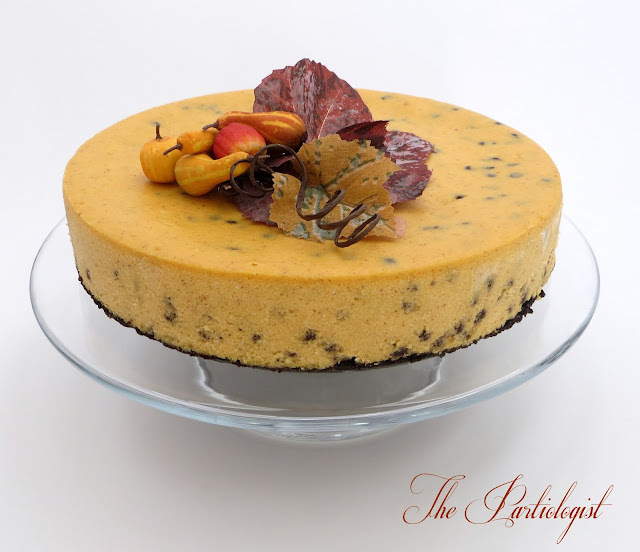 One of those things happens to be this recipe for the Chocolate Chip Pumpkin Cheesecake. No, it's not on the top of my "thankful" list, but I want to share it with you anyway. I just added a few fall decorations to the top. Nope, you can't eat those! Beat cream cheese, sugar, flour and pumpkin pie spice in large bowl until blended. Add pumpkin and eggs; beat until blended. Stir in mini chocolate chips; pour batter into prepared crust. Bake 10 minutes. Reduce oven temperature to 250°F; continue baking 60 minutes or until almost set. Remove from oven to wire rack. You always make everything look so beautiful. Good Morning to the Wonderful Partiologist! I would like to invite you to Thanksgiving Dinner at my house...Can you bring dessert? WOW ~ Does that look good! If I knew who you were I would come! Did I tell you, I recently changed my name to "Have a Cookie"? Just kidding! Congrats to her. I'm sure she'll enjoy the book. I love it. I am SO making this cheesecake for Thanksgiving. I was going to buy a pumpkin cheesecake at Costco, but after reading through this recipe - I hit PRINT and I'm writing my last minute Thanksgiving shopping list to include the ingredients needed. Thanks, Kim. You're the best!! How funny, did you know that I was believing you? Hope your cheesecake turns out yummy! I froze mine first before taking it out of the springform pan. That way I had perfectly clean sides and then I wrapped saran wrap around it, put it back in the freezer ready for Thanksgiving day! What a perfect Thanksgiving cheesecake. I love the colour and the flecks of the chocolate chips. And those decorations on top, I bet you could make them out of fondant, you have mad skills! I'd love to tuck into a huge slice of this right about now. What a sweet comment, no wonder your name is Sweet 2 Eat! My husbands favorite dessert is cheesecake. May have to make this one. Thanks for the recipe. Happy Thanksgiving. from,twobeautifulgirls. I hope you do - it's not too hard!